On the Lena river I saw a city called Yakutsk. The name sounded a bit funny to me, but I became curious about it somehow. And last month I went there. Yakutsk is the capital of the Sakha Republic, also known as Yakutia – the largest administrative region in the world that is not a country. The largest native ethnic group of Sakha, after which the republic is named, speak a Turkic language of the same name, although it is also frequently called “Yakut”. Even though I spent almost all of my Soviet life in Moscow, I was always very curious about all the other regions and languages of the USSR, so when I discovered Wikipedia, I devoted a lot of time to reading about them and to visiting Wikipedias in these languages, even though I cannot really read them. A request to start a Wikipeda in Sakha was filed in 2006, and I was quick to support it. After a few months of preparations it was opened. It is now one of the relatively more active Wikipedias in languages of Russia – it has over 8,000 articles, and for a minority language, most speakers of which are bilingual in another major language, this is a good number. 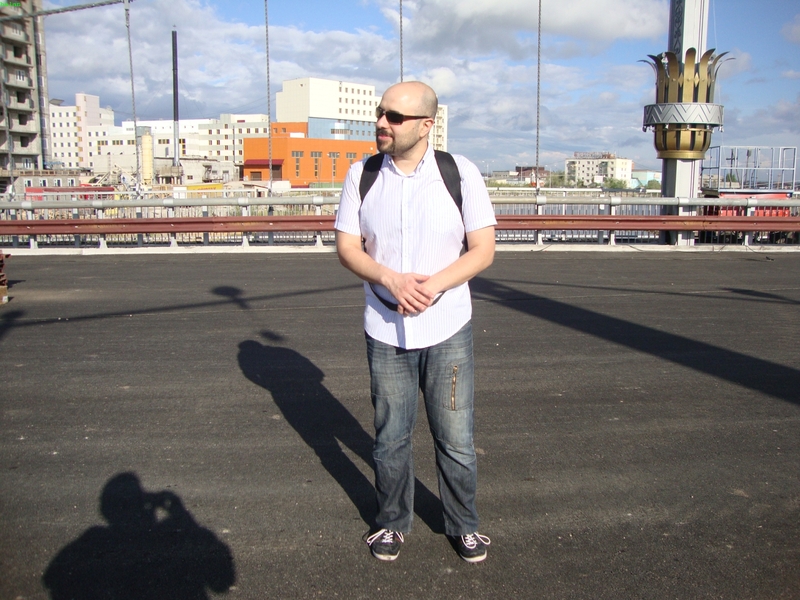 I kept constant and positive contact with Nikolai Pavlov – the founder and the unofficial leader of the Sakha Wikipedia – since the very start of this Wikipedia. 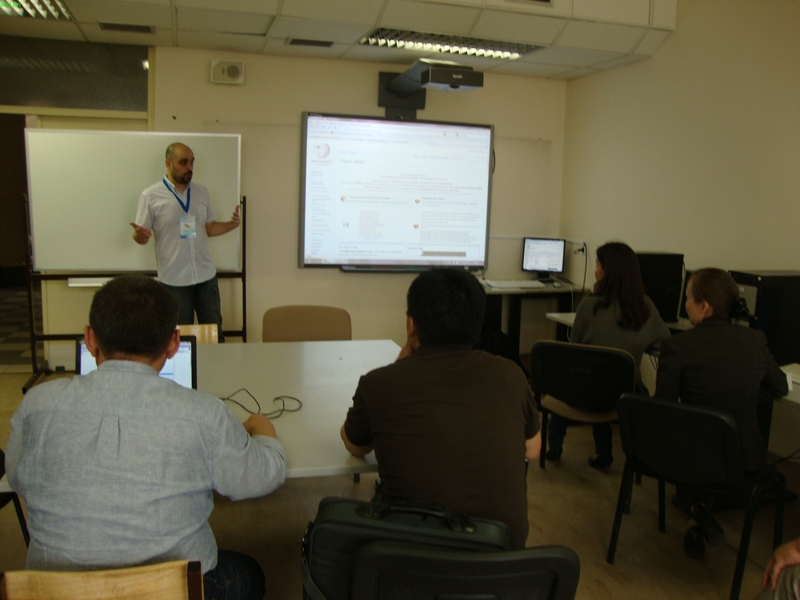 It was great to give these people technical and organizational advice: how to write articles effectively, how to choose topics, how to organize meet-ups of Wikipedians. For a long time I dreamt of meeting them in person, but because Yakutsk is so far away from practically any other imaginable place, I didn’t think that it will ever happen. 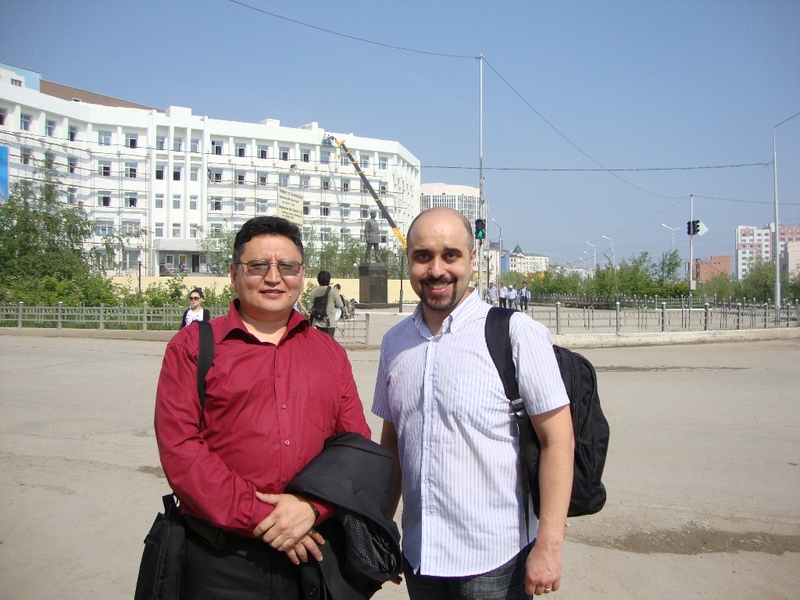 But in April 2012 I met Nikolai at the Turkic Wikimedia Conference in Almaty, Kazakhstan. A few days after that conference Nikolai suggested that I submit a talk for an IT conference in the North-Eastern Federal University in Yakutsk. At first I thought that I’m not really related to it, but after reading the description, I decided to give it a try and wrote a talk proposal about my favorite topics: MediaWiki and Software Localization. Somewhat surprisingly, the talks were accepted and I received an invitation to present at that conference. With Nikolai Pavlov, also known as Halan Tul. The unofficial leader of the Sakha Wikipedia and the excellent organizer of my trip to Yakutsk. I flew from Tel-Aviv to Moscow, and then six more hours from Moscow to Yakutsk. Yakutsk is apparently a modern, bustling and developed city, but with interesting twists. Most notably, because it is in the permafrost area, all the houses are built on piles and all the pipelines are above ground. But actually this is just a small detail, because the general feeling is that it was a whole different country from the European part of Russia, to which I was used, and in a very good way. I was most pleasantly surprised by the liveliness of the Sakha language: practically all people there know Russian, but the Sakha speech is frequently heard on the streets, Sakha writing is frequently seen on advertising and store signs, and Sakha songs are played from many passing cars. 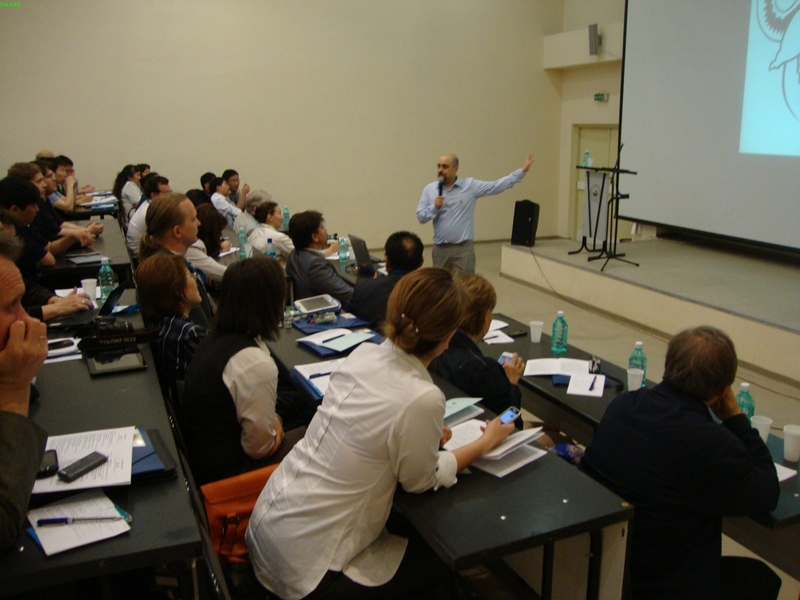 The conference was very varied – with presenters from South Korea, China, Bulgaria, Switzerland and major Russian cities – Moscow, St. Petersburg and others. The topics were very varied, too, but the central topic was using computer technologies for education and human development, so I felt that my talks about Wikipedia and software localization were fitting. Presenting my main plenary lecture about software localization. One of my main points is that using Free Software, represented by the GNU head, is very easy to internationalize. Except participating in the conference itself, I also attended many meetings that Nikolai organized for me. It was fascinating to meet all these people. 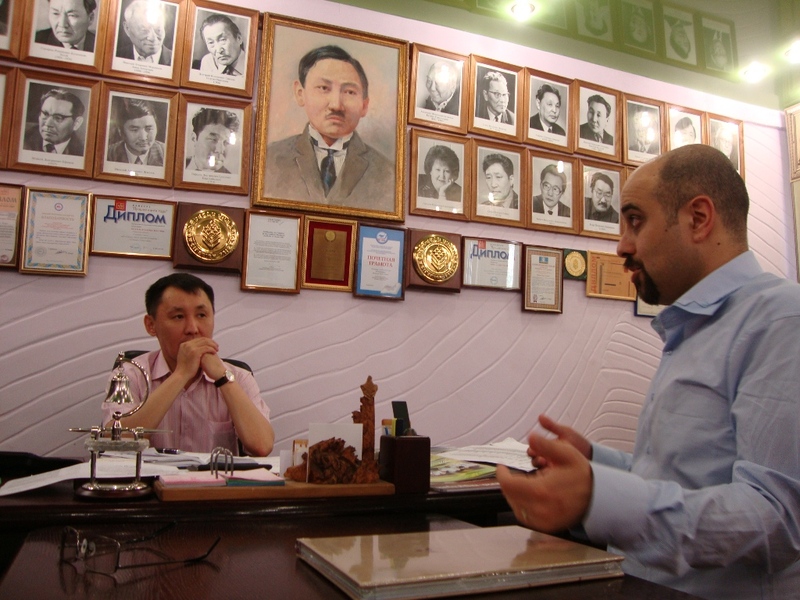 Meeting the manager of Bichik, the national book publisher. On the wall – portraits of notable Sakha writers. I spoke to the editor and the manager of the republic’s largest book publishing company – they told me that the local literature has great artistic value, but since less than half a million people speak this language, it’s hard to earn a lot of profit from it and to develop it. They also complained that some authors – as well as some deceased authors’ families – are too harsh about copyrights. I suggested them to try to talk with authors and release some works under the Creative Commons license and see whether it gets them more exposure, and they promised to read Lawrence Lessig’s “Free Culture” book. Meeting Yakutsk linguists and explaining them how putting their works on Wikipedia will make them much more accessible to the whole world. I also met with linguists from the university, who work on researching and documenting the Sakha language and other languages of the region, such as Evenki and Yukagir. I suggested them to use Wikimedia resources for storage and documentation of the works they gather, and they liked the idea; I am definitely going to follow up with them on that. 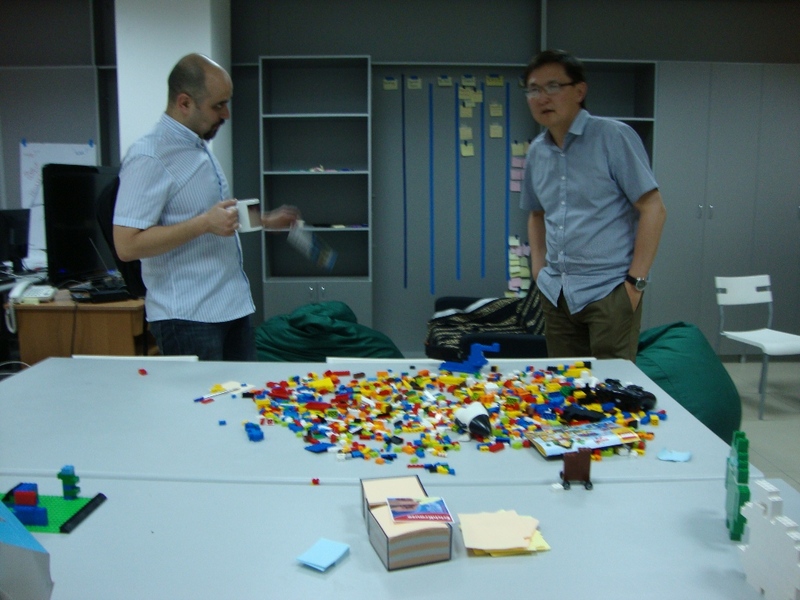 In the offices of Ykt.ru, with the manager of the company – and a Kanban board in the background. Another great meeting I had was with local tech people – a community of proud local IT geeks, who had lots of ideas for promoting Wikipedias in regional languages, and also the management and the employees of the local Internet portal ykt.ru. Their offices look just like a building of a hi-tech company in the Silicon Valley or in Israel – with cozy rooms and lounges, and a Kanban board. The people made an excellent impression on me, too: we had a very professional and engaging conversation about developing web applications and agile management methodologies. I also spoke to several journalists and to the local TV and radio stations, inviting people to read Wikipedia in their own language and to contribute to it. I felt a bit like a celebrity, and well, I hope that it made somebody realize how effective can the Internet be in promoting local cultures and how proud should people be about their own languages. One last comment is about the Sakha literature, which I mentioned earlier. I return from almost all my trips abroad with a lot of books about the local languages and cultures. And I actually read them. It happened in this trip, too, except this time most of the books were given to me as gifts by all those very nice people that I met. Sakha prose and Olonkho poetry in translation to Russian are simply wonderful. In all honesty. This is beautiful world-class literature and it deserves more exposure. If this little blog post made you curious about it, then it’s the most important thing that it could achieve. In Wikipedia in every language you can go to a page called “Special:LongPages” and see what are the longest articles in that language. The longest article in the Polish Wikipedia is “Finnish grammar”. It’s 117 pages long in print – basically a book. The longest article in the Telugu Wikipedia is “Adolf Hitler”. The longest article in the Kannada Wikipedia is “History of the SLR camera”. The second longest is “Adolf Hitler”. Kannada is spoken in India near Telugu. The longest article in the Italian Wikipedia is “List of serial killers by number of victims”. The longest article in the Hindi Wikipedia is “History of Australia” – about 50 pages in print. The article “History of India” will take 5 pages in print. The longest articles in Chinese, Japanese and Korean Wikipedias are related to video games. Finally, the longest article in the English Wikipedia is “List of Advanced Dungeons & Dragons 2nd edition monsters”. People who work with Wikipedia quickly run into the interlanguage links – links to other versions of the same article. Inside Wikipedia lingo they are also frequently called “interwiki links”, although actually it’s not quite right: Interwiki links is a much wider concept. Wikis existed long before Wikipedia was the most popular wiki of them all. They were a strange idea – websites that anyone could edit. They tried various ways of creating an inter-wiki community, in which different wiki communities would exchange ideas and reuse content and skills. Various schemes to do that were proposed, but none of them ever caught on – the old-days wikis were respectable, but small, and the web was too large and free-form. And then Wikipedia came. Wikipedia started as a yet another wiki, so it tried to blend in the wiki community. At some point it got interwiki links – easy ways to link to other websites. It is easy to link to another page inside the same wiki by adding square brackets, and it is only slightly harder to link to another wiki: Instead of writing a whole URL with http and all that, you would just write a short prefix and a name of a page, and that’s it. But to which wikis it is possible to link? Thanks to the popularity of Wikipedia, MediaWiki and other wiki engines, there are thousands of them now, and you don’t have prefixes for all of them. The prefixes for Wikimedia projects were managed in the internals of the database by the small group of developers. The list was exported to the Wikimedia Interwiki map. And actually… it wasn’t used that much. The old dream of having a network of wikis which are not just Wikipedia hasn’t come true yet. But this may change now, because recently the process became more open and user-friendly: The Interwiki extension was installed on Wikimedia wikis. This extension allows displaying all the available interwiki prefixes in a dedicated table. It also allows users with appropriate preferences to edit them. Take a look at the Interwiki table for the English Wikipedia and you’ll see all the prefixes. Many of them are language codes – these are the interlanguage links. But there are many others: wiki communities of city residents, scientists, programmers, librarians, enthusiasts of countries etc. If you try the URLs in the list, you’ll see that some target sites are sadly dead, so they should probably be removed from the list. But others can be quite promising – for example Appropedia, a knowledge base of collaborative solutions in sustainability, appropriate technology and poverty reduction. That’s a very positive thing, not just because sustainability is a nice thing, but because it’s great to have many specialized information sources and not just one huge Wikipedia. Now Wikimedia wiki communities can add their own interwiki prefixes to link to other websites that may interest them. An example off the top of my head is that the Slovak Wikipedia community would add a prefix for easy linking to a site with information about Slovak culture. Of course, the language and the topic can be just about anything. This feature, just like all other MediaWiki extensions is translatable to all languages in translatewiki.net. For example, here’s the translation of the Interwiki extension to Hebrew. The translation of the Interwiki extension to the Slovak language, which I mentioned earlier, is not complete yet and should be completed. If you are curious in translating the extension or any other component of MediaWiki into your language, open an account at that website and just start translating.